You may be more comfortable sizing downward for open-back models (for example, if you are a US size 11, you may want to choose EU size 44). 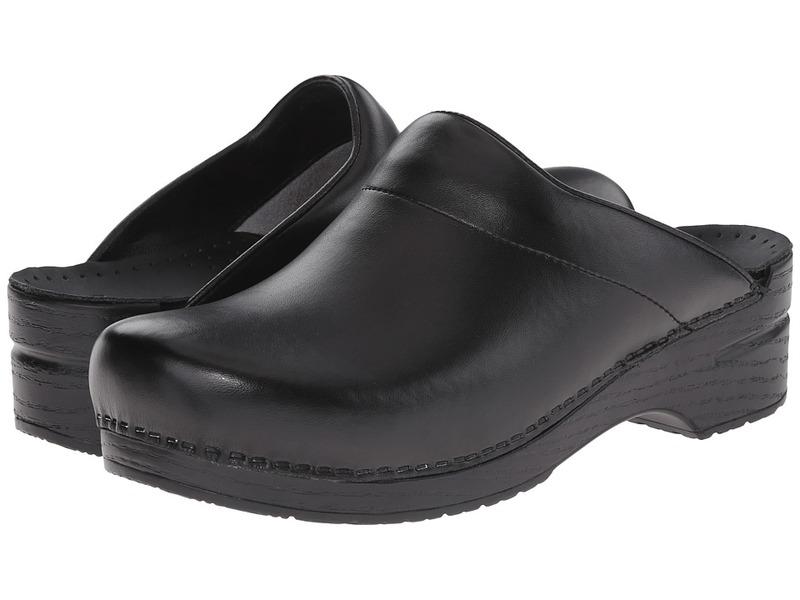 Dansko~s most traditional open-back style for men that takes on the critical role of providing comfort to those in the nursing, hospitality and other occupational fields. Your heel should be either even with or slightly forward of the back of the clog and your toes should not hit the front of the clog. High quality leather upper follows the natural contours of the foot. Box leather is ideal for the workplace environments with wet, acidic or greasy conditions. It has a smooth, clean finish with the natural irregularities removed. It is the easiest leather to maintain, and can be wiped clean with soap and water. Roomy Thermoplastic toe box provides durable reinforcement and toe protection while allowing toes to move comfortably. Nonallergenic vegetable tanned leather sockliner wrapped around synthetic foam absorbs and evaporates perspiration. PVC inner frame provides stability and reduces torque and pronation. Dansko~s Stapled Clog Collection proudly carries the Seal of Acceptance from the American Podiatric Medical Association. Measurements: Heel Height: 2 1 4 in Weight: 1 lb 1 oz Platform Height: 3 4 in Product measurements were taken using size 42 (US Men~s 8.5-9), width Regular. Please note that measurements may vary by size. Weight of footwear is based on single item, not the pair.